Kirk Garrison is an active performer, educator and composer in the Chicago area. A veteran of the Chicago jazz scene, Kirk attended Mankato State University in his home state of Minnesota from 1978-1982 before honing his skills in the United States Air Force Band. After leaving the Air Force in 1992, he completed his masters degree in Jazz Studies at DePaul University where he served on the jazz faculty from 2001 – 2013. He is currently on faculty at Concordia University (Chicago) and Elmhurst College (Elmhurst, IL). 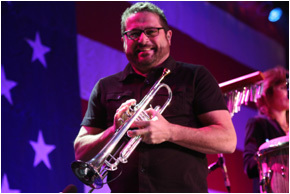 As a member of the Lt. Dan Band featuring actor Gary Sinise, Kirk performs for scores of active duty military members, veterans and their families, including many charity organizations for disabled veterans. The band has toured extensively in the United States, Europe, Asia and the Middle East. He was recently commissioned to write arrangements for internationally renowned jazz artists saxophonist Phil Woods and drummer Jeff Hamilton. His symphonic arrangement of Nature Boy for orchestra and choir premiered in Chicago in 2010. He has written commissioned arrangements for DePaul University, the Chicago String Ensemble, the Heritage Chorale of Oak Park Il, the Millar Brass Ensemble at Northwestern University and Louis Prima, Jr.